I have many cards sitting on my desk that didn't ever make it to the mailbox. Next year will be better, promise! I thought the saying on our card was perfect this year for obvious reasons. Thanks to my brother for the amazing pictures. And thanks to Jesus for giving us two babies to celebrate this Christmas. Jesus is the miracle babe that came small and lowly and Levi is the gift of love that burst open and grows from your hands. Miracles! 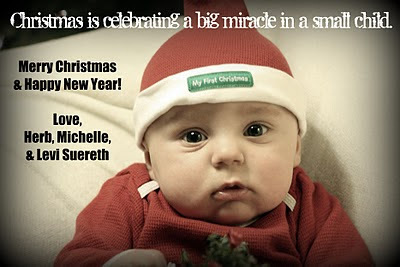 His love most of all..
merry christmas to you guys, Michelle! Laughing Our Way Into 2011! !